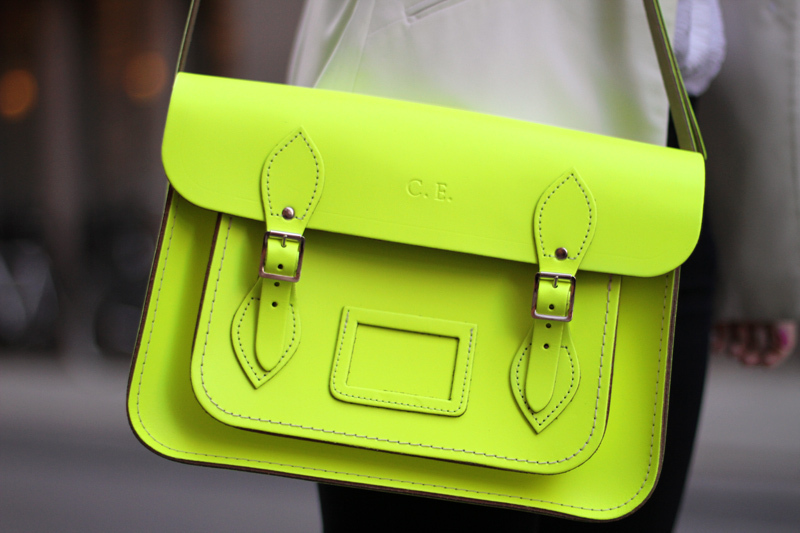 Fluorescent satchel, Cambridge Satchel Company. FLUO. My yellow fluo satchel just arrived, and when they say it’s bright they’re not kidding! Tried to photograph this bag over an hour but the color is impossible to catch, in real life, it’s almost painfully bright. I guess it’s just one of those bags you have to see in person to fully experience and appriciate it’s beauty, because it’s truly amazing!! Went for a smaller size this time (13″) and to Cambridge satchel company’s defense, the shipping + service was about 100% better this time, way to go! :) Will post the rest of the outfit tomorrow! Oh my god. It’s like someone attacked it with a highlighter! And yet I’m strangely in love with it. I’m glad that the service was better for you. I love it!! I want the green one so bad!!!!! I am drawn to it like a moth to a light…can’t.stop.looking. ooooo LOVE IT! I have shoes this colour- hmmm I wonder if would be too much fluro bag & shoes! This is beyond beautiful & amazing . . . wow! Wow, great – hard to believe that it would be even more amazing in real live. I like that you had your initials engraved, that makes it more personal. oh wow, what a beaut! i am in love with this! The photo is also really beautiful! It is so pretty. Wish it was mine! Absolutly in love with it!! So cool the bright yellow color. Cant possibly imagine it being even brighter! Eheh gorgeous! wow its so stunning, i am stunned. Cannot decide which colour to order! I love that they personalise it…such a nice touch. neon on cambridge satchel?? Fantastic!! in LOVE. ive wanted this bag and i think i might just bit the bullet….though i DID just get the celine boston bag too. ugh. why do pretty things have to be so expensive. Reminds me of my bag! (The Kate Spade Essex Scout in a really BRIGHT NEON yellow). whoa, loving this. highlighter colors are the best. ABSOLUTELY DELIGHTFUL, I WOULD WEAR IT PROUDLY!!! I’m in love with that bag! It remindes me of highliters we use at school! Amazing! Totally coveting that satchel this instant. Such a wild and beautiful hue. Can’t wait to see you dolled up in it! love the bright green bag. so color blocked and fabulous. Love , Love , Love this! wooww!! amazing bag! love the colour! Love the color. These bags are everywhere now! I love the color!! It’s so pretty!! Can I use this photo for my blog? Love the purse! it’s such a statement and eye-catcher! This looks like it would be gorgeous in person! The color is already stunning here! Great color! I love the bags! Oh I’m dying to buy the green one. I love them! you have an amazing style, I saw your pics on lookbook! hope to see you on our blog. Hello, i like our blog very much!! Look my blog d follow ? This bag is beautiful! It’s so cool that it’s customized! This is so awesome. It has a great Proenza Schouler vibe, non? wow.. that is bright, but how fun! Totally works with so many outfits and talk about standing out in the crowd – enjoy it! they have asos exclusives and there’s this gold/metallic and a vintage leather one which is really pretty! yours are great too, i wonder if they do initials if you don’t buy it directly from them? aaah! this bag is amazing! I’m literally in LOVE with it! The color is incredible! I love those, the colors are thank god painfully bright! Come by my giveaway and win a pair of TOMS! that is one stunning bag! bright and beautiful! whoa.. gorgeous bag! the color is insane.. in a good way. ha! this is such a crazy colour! it’s so beautiful and bright! I am OBSESSED with this bag! It’s everyone, and I NEED ONE!!! Heey!This is awesome!I really love the colour! Please check my blog!It’s brand new!Hope you have the time to see it! That bag seriously amazes me, I love, love, LOVE it! It still looks really great. I definitely want one of these bags. My colleague just showed me this bag which she bought over the last weekend, and there this is, I see it on your blog! Amazing bag! I need one! love this bag so much – just bought mine and can’t wait for it to arrive!! Thanks for sharing! Letâ€™s see what you did!